I first became aware of Bar Boats in the 1950s when I was serving in the famous wartime ship, HMS Starling. This was my first appointment on promotion from the lower deck. 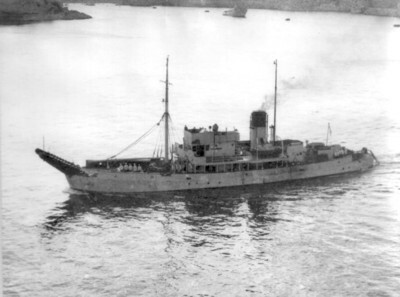 Starling was attached to HMS Dryad as a navigational tender and all grades and nationalities were instructed and examined onboard. News of a Bar Boat running aground and up the beach in a Scottish loch (the crew were reputed to have stepped ashore) was greeted with much amusement and derision, especially when the enquiry board revealed that that a fix had not been recorded for at least four hours. In Starling a variety of fixes hit the chart every 15 minutes; a Decca, radar, terrestrial and a D/R all on top of each other. At the end of each watch you could almost plant potatoes on the chart. My next appointment was to the Bar boat HMS Barnard based in Scotland. Sixty-three Bar boats were produced during the period 1937 – 1942. These dirty little work-ships of coal and steam propulsion maintained boom defences all around our coastline. Where oil fuel was unavailable, lumps of coal were usually abundant. And so it came to pass that this young enthusiastic Boatswain joined Barnard on a bleak day in Greenock. She was nestled in Victoria harbour with several similar vessels. The nearby boom defence depot was still in working existence but completely hidden from view behind stacks of those circular boom buoys that are still used today as navigational and sail racing marks. Many wartime legacies remained including five and eight ton concrete mooring clumps that were put out to tender at a shilling each. Their collection and transportation was the buyer’s problem. Our main activity was the maintenance of moorings, a very large number of which were still being used in the area. Mooring work for the sailors (or ‘boomers’ as they were known) was both interesting and gratifying. Changing a complete mooring could take several days. On being tasked, the vessel would embark a complete mooring outfit. The cable was hauled aft and faked down one side of the ship’s iron deck with the replacement buoys and anchors hanging from the horns, the large chunks of metal that gave the boat its distinctive wheelbarrow appearance. The ship proceeded to the position of the old mooring and secured to its buoy. Then the task of hauling up the old ground chain commenced in earnest using the ship’s powerful after winches. It was a smelly business and an incredible sight to see cable that had been lying on the seabed for several years passing over the apron between the horns before being hauled aft along the deck, past the wardroom galley and bathroom. The cable was usually full of an assortment of wriggly things popping out of the enormous amount of encrustation and marine growth that virtually doubled its size. In those pre-television days, life on board for the 30 or so ship’s company was pretty basic especially when on task away from base. One evening, after completing a typical working day on a harbour mooring, the crew reduced to a few duty men. The rest became liberty men and piled into the cumbersome, heavy boom boat and rowed ashore. Night came on and with it the customary thick Scottish mist. I made regular visits to the bridge where the duty leading hand, a young Leading Stoker called Tony Standish, was contemplating his paint brushes and keeping a good lookout for returning liberty men. After several bridge visits, Tony and I reckoned our resourceful sailors must have found accommodation so I turned in. Later Tony heard familiar voices: "Come to port"… “No, come to starboard.”… “She's over there", etc. The boys had ‘borrowed’ pedal boats from a nearby holiday complex. Early the next morning, these rogues turned out, returned the pedal boats and retrieved our own boat. Plain food was generally accepted, even with the thin veneer of coal dust that covered the soup. Extra pay (hard layers) and a different type of service life produced a happy bunch of sailors with tremendous camaraderie. Discipline within the vessel loosely followed the standard pattern but rough justice was occasionally meted out and accepted. Such was the case when the Coxswain brought a new member of the ship’s company before the First Lieutenant. He had flatly refused to assist the Chef. “Perhaps you would prefer to help the engineers with ship-trimming instead?” asked the First Lieutenant. “Yes, Sir,” replied the miscreant not realising that trimming necessitated shovelling two tons of coal from one side of the ship to the other. Soon afterwards, the invitation to join the Chef’s union was readily accepted. These cumbersome vessels steamed around the waterways burning up an enormous amount of fossilized fuel. I recall the full bunkers had a 200 ton capacity and were ordered not to use more than 50%. Again from memory, a Bar boat would consume some 25 tons of coal a day so refuelling was a frequent requirement. Today’s expression ‘RAS Solids’ was very factual then….we coaled ship. Coaling facilities were still fairly common in the 1960s. The main provision for us was in the harbour at Greenock. The men employed on the coaling dockside were casual labourers, so casual in fact that they sometimes failed to come to work. Our ship’s company relished this state of affairs because they would undertake the shore side loading and, at the end of the day, the First Lieutenant would pick up the workers’ pay and share it out. Ingenuity and improvisation shone through on these unorthodox occasions. Without the steam train, sailors would run out the ship’s winch wire, attach it to a coal wagon and haul it along the rails. Coal bunkers were accessed through manholes in the waist of the ship, adjacent to the galley on one side and the bathroom on the other. Only one side was filled at a time. When the ship took on an appreciable list, we ‘wound ship’ and worked the other side. We coaled in other places; some good, some not so good. In Stornoway, five-ton trucks were backed to the edge of the jetty and tipped. At low water this made for quite a dusty avalanche. On three occasions we had to dig the Chef out of his galley. Lunch was a little late that day. The best fuelling we enjoyed was from the coaling hulk in the upper reaches of Portsmouth harbour. Once secured alongside, loaded grabs released their black lumps just inches above the bunker holes. We were, however, spoilt for choice; there were several types of coal on offer. Our Chief engineer was confused when asked for his preference because we had only ever used one sort until then. “We have a good selection,” yelled the hulk’s foreman. “…from Newcastle nuggets and Cardiff cubes to Woking (or some such town) nutty slack.” Our perplexed Chief spun a coin, got it wrong and we clinkered up (produced large lumps of cinder) all the way to Rosyth. We were in Portsmouth because we had been tasked to carry out trials with a new piece of minesweeping equipment. Some will remember this as ‘Osborne’ which later (much later) became the Towed Acoustic Generator used in today’s Hunt Class MCMVs. I reflected on this; a brand new piece of technology on the one hand and lumps of coal on the other. I think our passage down from Scotland took four days. I remember a last visual fix on Chicken Rock lighthouse on the Isle of Man then low visibility until the Bristol Channel 16 hours later. How we cynics in Starling had chuckled about that four hours without a fix. Later that year, Barnard’s daily toil of dirty coalface work was suddenly transformed when she was chosen to be the guard ship for the annual Clyde International Dragon Class yacht races. This comprised a series of very competitive events spread over a two week period and was based in the harbour of Rothesay. It drew competitors from all over the world: America, Australia, Russia and even the UK. The UK entries included Prince Philip’s Dragon BLUEBOTTLE. After recovering from the shock of this announcement, the ship’s company buckled down to the wishes of their cheerful leader, the ‘Buffer’. They set to with cleaning gear and paint brushes. The transformation was incredible. As a further part of our preparations, the sailors were paraded in their best blue uniforms…I just didn’t recognise them. The day came when we slipped and proceeded to Rothesay with our smartly turned out ship’s company subjected to the jeers and laughter of the dirty brigades in other ships of our squadron. The 50 competing yachts were already assembled in Rothesay when we arrived. Many of them were at their purpose laid moorings with others ashore in cradles receiving a final touch up. Our daily task was to steam out to an Olympic circle of buoys and align ourselves up with one of these, depending on wind direction, to form the starting line. The start, conduct and finish of the races was overseen by the embarked committee. This committee worked under the appointed Commodore, Mr Teacher of the whisky producing family. This caused us some concern as we only had Bells onboard. Fortunately, he drank gin and tonic. Many VIPs joined us on a daily basis to witness the races including Princess Irene of Greece. She was there to support her brother Prince Constantine who was racing with their sister Sophie, now the Queen of Spain. We only provided soup in our crowded little mess and I recall a lady-in-waiting requesting another bowl for Her Royal Highness. Chef boasted that he would probably be offered an appointment to the Royal Hellenic household. The races were exciting and went well despite a couple of hiccups. I always assumed that any line extending between two points had to be straight but when 50 competitors yelled in a variety of languages that it was crooked, I began to have my doubts. Come the start of the first race, the Dragons creamed past our bows with just inches between them. The eyes of their helmsmen were usually set at waterline level, completely ignoring the overhang of our ‘horns’. After several near misses, there was an almighty prang as the shrouds of one boat struck and he swung round. The ‘knock-on effect’ was… untidy. Thereafter, we lowered a precautionary marker from the end of the horns to hang just above the water. Meanwhile back at the ranch, the Boom Defence Officer had decreed that whenever possible, ships going out on task were to embark a couple of 8 tons clumps and drop them in very deep water. It seems he could no longer see out of his window. This gave me a good opportunity to do something for the nearby Royal Gourock Yacht Club. Whenever a Bar boat was able to pick up a couple of these surplus hunks, they were invited to drop them in pre-arranged positions off the yacht club as moorings for yachts and dinghies. I never bought my own beer in the clubhouse for the rest of the commission. I wonder if my credit is still good?